Jennifer Ficker-Halupnik, born profoundly deaf, knows what oppression is. From her early years, she experienced prejudice and discrimination—e. g., being discouraged from enrolling in Advanced Placement classes in high school, even though she had a teacher’s recommendation. Ficker-Halupnik, 31, grew up in Western Hills, Ohio. Her parents are hearing; one of her two sisters is also Deaf. Her parents have always been supportive, advocating for better education for their daughters and encouraging them to read. She was the only Deaf student in her school district. She says she received a “fine, balanced education,” but “the biggest challlenge was isolation,” the isolation of not having any Deaf teachers or other Deaf mentors. Outside of school, though, she had “a support system of friends from the Deaf community,” and that made a difference. 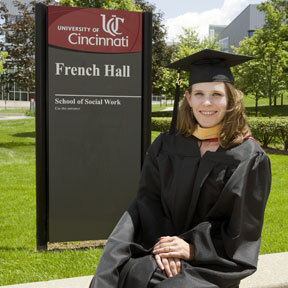 She earned her Bachelor’s in Social Work at Miami University, then entered the Master’s program at University of Cincinnati, as it offers an emphasis in Mental Health. She and her husband, Greg (also Deaf) have three children and live in Hamilton. According to Dawn Fuller, UC’s Public Information Officer, “Her internship involved working with a community mental-health center in Indiana. She provided therapy for Deaf clients and educated them on how to report discrimination or oppression.” And she did outstanding work, establishing bridges between fellow students, professors, and the Disability Services Office—educating others and advocating for Deaf-accessible services. That’s what Ficker-Halupnik plans to focus on during her career, and we wish her a long, successful, rewarding one.